If you are in need of any security services for Residential, Commercial and automotive, call us immediately. 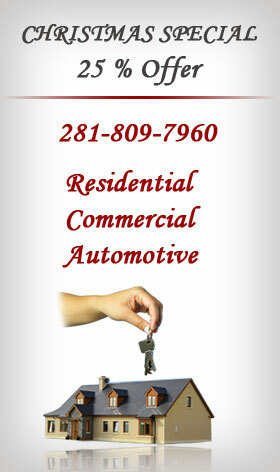 We are one on of the best service providers offering quick services to the residents of League City 77573, 77574. We offer Commercial, Residential and Automotive services in a cost effective way. Our team of experts offer the best services as they have the best technical knowledge and vast experience to tackle most of the security issues. We are customer centric in our approach and we care for your safety. Our certified technicians have undergone stringent training and they know what they do. Installation of all kinds of security locks. Handling all kinds of emergency lock outs. Installation of CCTV, intercom and alarms. Rekeying and all kinds of lock repairs. Highway breakdowns and other automotive emergencies and lockouts. Fixing of garage doors and locks. If you are searching for an efficient service provider who can offer affordable security services, call us immediately @ 281-809-7960. We will respond to your call immediately.